I wrote that paper planners are tools for the experienced people in the article "The setback in paper planners prompted me to start developing Dreamscope.". I introduce the reason why I think so in this article. Make the draft of strategy for accepting the order. Have the meeting about the strategy for accepting the order with a sales manager. Have the kickoff meeting and share the strategy with the people involved. Have a rehearsal of the presentation. The day of the presentation. And you should copy tasks and appointments in the list to the calendar on the basis of the required time for each item and the schedule of the people involved. I mean, you have task design missing between No.1 and No.2 in the use of planners described above. Why do you have task design missing in paper planners to practice reverse thinking ( or goal oriented thinking)? However, as described above, you have No.3 missing in existing paper planners. I think that is because task design forces you to copy tasks to the calendar. And, those who can wirite down tasks on the calendar without creating a task list are those who can design tasks in their mind perfectly and so really experienced people for the task management. Most of paper planners to practice reverse thinking are produced by the successful people. I guess the successful people know easily and precisely necessary tasks to achieve any goal and the required time of any task because they are really experienced and achieved impressive results. That's why they can write down tasks on the calendar from goals directy without the step of task design. However, those who are not good at the task management and planning their life don't work that way. Skipping the step of task design often causes them to fail to plan and reschedule appointments. I can really understand this situation because I have experienced it many times. Dreamscope allows you to practice reverse thinking ( or goal oriented thinking ) easily. Dreamscope is a task management tool that incorporates the following concepts. Today's story is as for No.1 and No.2. Dreamscope allows you to practice task design(No.3 in the steps of reverse thiniking) and scheduling(No.4 in the steps of reverse thiniking) independently without copy. In addition to that, Dreamscope let you add or edit tasks easily with the intuitive UI. You create the necessary tasks for the goal. The most important thing is to create all necessary tasks to achieve the goal. I recommend you to create folders to organize tasks, if you have a lot of tasks. You only have to set a date to each task loosely in this step. You can check the feasibility of your plan while seeing the required time for all tasks in each day on the calendar. 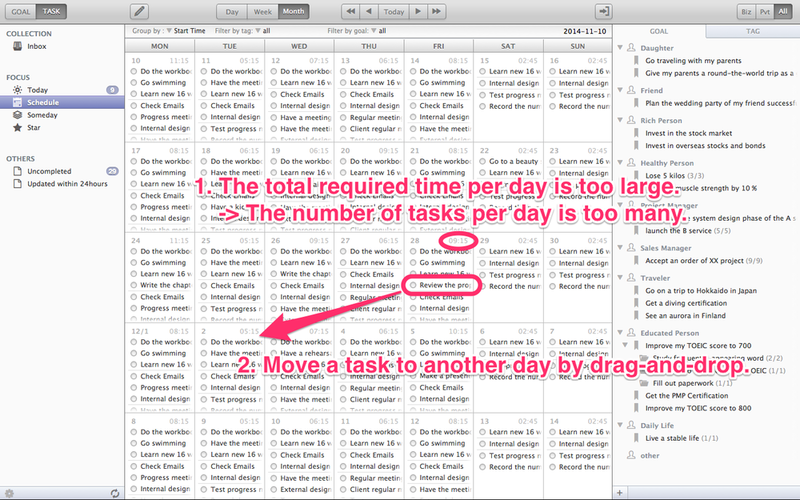 If you find impossible amount of work in a day, you can move the tasks to another day just by drag-and-drop. Dreamscope's filtering function is very powerful. It allows you to see only what you want to see, for example, tasks in the specific goal or folder. You can check the order of tasks in the specific goal easily. Actually, it's also difficult for inexperienced people to practice scheduling tasks or appointments in paper planners. The details about scheduling will be reported in the next post. Newer PostCan you give an immediate answer about when you can finish an assigned task? Older PostThe setback in paper planners prompted me to start developing Dreamscope.